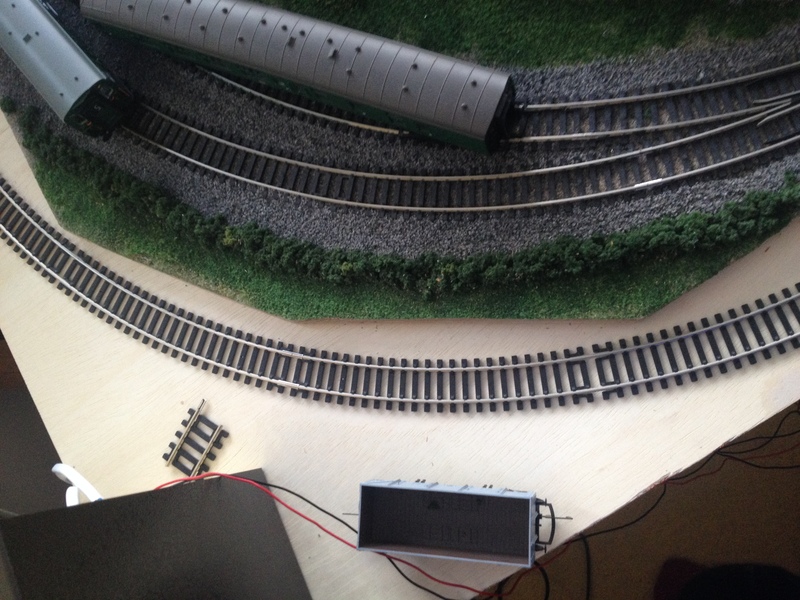 Following on from Episode 14 I now have all the required extra bits of track to complete the new outer oval. 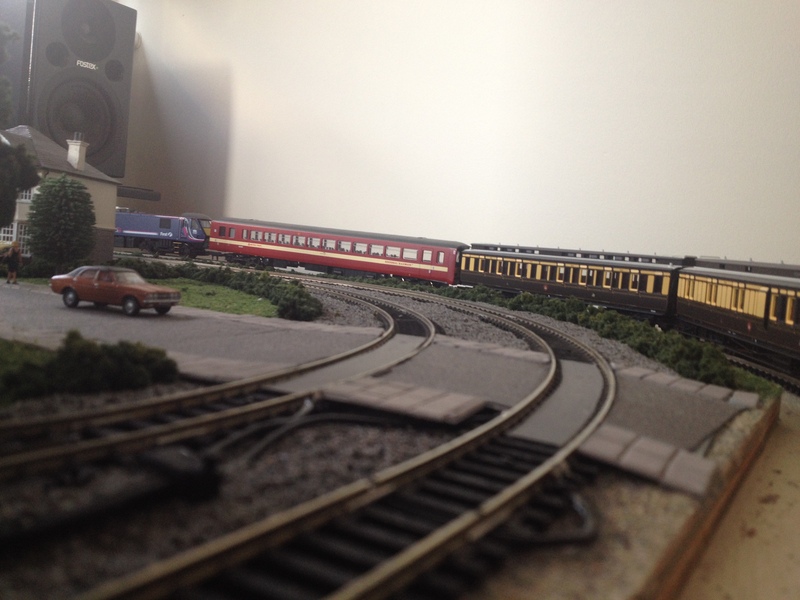 Here’s a rather suspect panorama (thanks to iOS7) of The Mainline with the additional oval. It’s hard to spot in the picture above but at the rear of the layout the oval runs on the old boards and at the front it drops down and runs on the new woodwork. This means either side must accommodate a modest gradient to raise and the lower the line between the sections. Supporting the gradient is a work in progress, currently I’m experimenting with layering up sliced bits of cork floor tile. I’ve noticed most problems occur when pieces of track join. Making sure these joints are as smooth as possible has been key during testing. 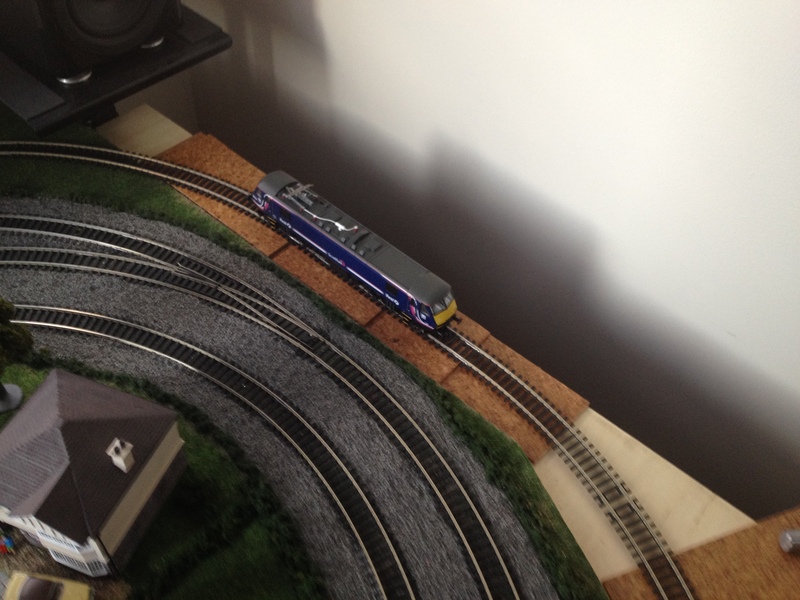 I’ve then been testing locos and train sets making sure they run smoothly and don’t struggle with the gradient. The London Transport 5700 tank engine is put through it’s paces pulling a Class 155. There’s still a little layout infrastructure that needs to be taken care of… The above picture shows that the outer oval is awfully close to the old board. 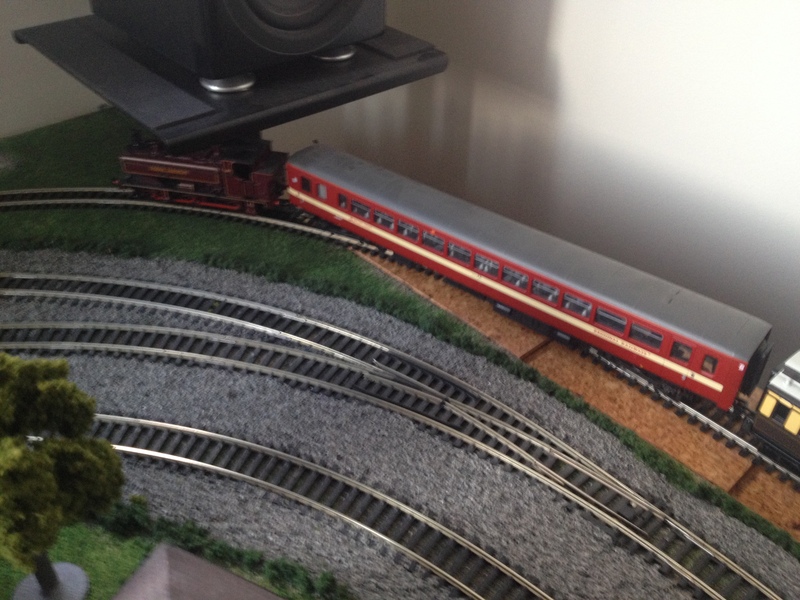 In fact it’s impeding the loading gauge of some of the longer coaches. As I want to run longer trains on the outer oval I’ll sand the old board back at these points. It’ll also make it more aesthetically pleasing! 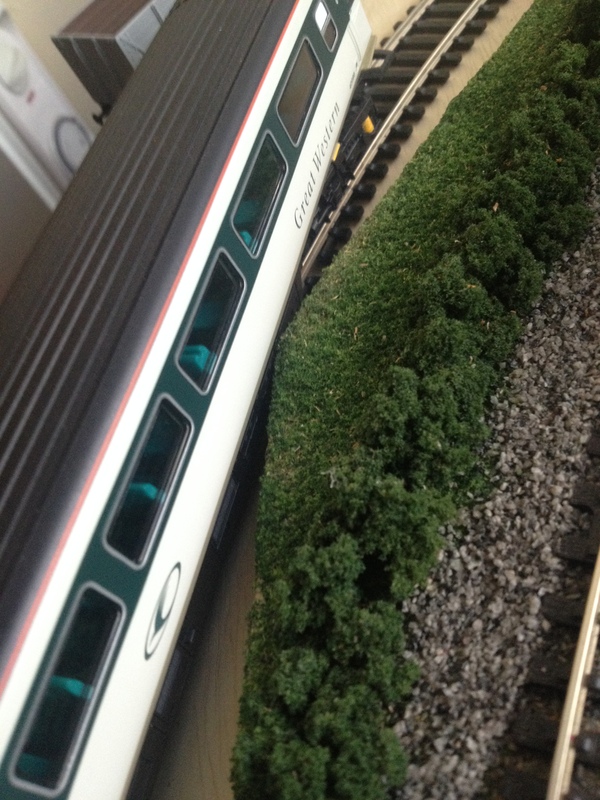 Once gradient experiments are complete I’m going to separate the boards whilst I work on modelling the scenery on the new oval. I also need to somehow attach the old board to the new board to stop it slipping. I’m thinking No More Nails, but I’ll keep you posted with that! 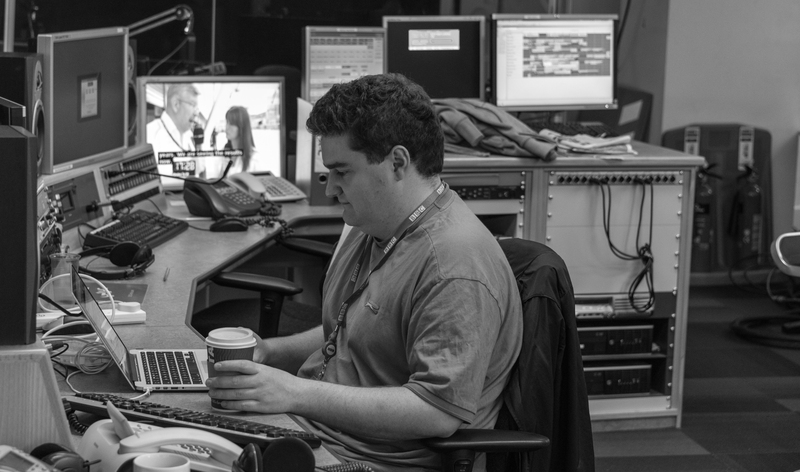 Post Amble: You may have noticed that I’m somehow back to Episode 15 when the last edition of this blog was once Episode 18. This is because I’ve removed Salford Chapel from this numbering system as it no longer made sense on the new site.